An ability to forge good relationships with strangers is critical to shaping a future in today's society, Kettering Foundation president and chief executive officer David Mathews told Samford University students Thursday, March 7. "The quality of life you have will be dependent on the relationships you have with strangers," said Mathews, although those strangers "may not necessarily like or trust you," and vice versa. The challenge, whether on an international, community or campus level, he said, is to find a way to work with strangers to make things work. Mathews spoke as this year's James A. Auchmuty Lecturer. The government, as useful as it is, is not able to solve a lot of problems, and people want to be able to shape their futures. Mathews told the students that while he is confident their generation is mastering the challenges of working together to solve problems, he is unsure that his generation has prepared them to do so. A case in point is the "proving yourself to somebody else" culture, which sends a subtle message that "you've got to prove yourself to somebody else." That thinking implies that something is missing, and robs people of their self confidence. "You are a complete package," he said. "You will have a lot of surprises and make a lot of mistakes, but will find resources you never knew you had." 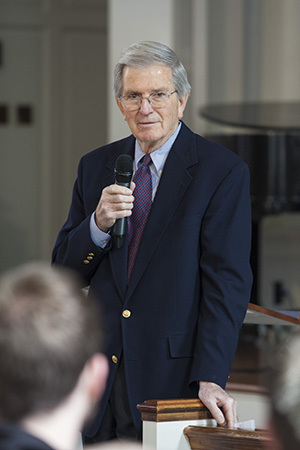 Mathews, who became head of the Kettering Foundation in 1981, described the organization's research efforts that include studies on citizen, or non-governmental, diplomacy. "Many times governments will work at cross purposes and diplomacy will break down precisely when it's needed most," he observed. The Foundation shares research with organizations in 70 countries, including the Arab-Democracy Network in the Middle East and a new forum of Jews and Arabs in Israel. While the participants in the other countries are strangers who "aren't like us, and they don't always like or trust us as a nation, we need them," he said. "We've just got this one planet and we're going to have to figure out how to get along," said Mathews, who prior to his Kettering post was U.S. Secretary of Health, Education and Welfare during the administration of president Gerald Ford and was president of the University of Alabama from 1969 to 1980. Mathews encouraged the students who will stay in Alabama to press for reform of the state's 1901 constitution, which "takes rule away from our communities." Yet, he said, shifting power from the legislature to county commissions won't necessarily guarantee home role. "That will take another change at the community level, which may mean being able to join with strangers to make good things happen." Dr. Auchmuty introduced Mathews at the program in Reid Chapel. Their friendship goes back to their college days in the 1950s, when both were active in Baptist Student Union activities in Alabama. Auchmuty was president of Samford's BSU, and Mathews, a student at the University of Alabama, was state president of the organization. Both men also served on the Judson College Board of Trustees in the 1970s. Auchmuty served 27 years as pastor of Shades Crest Baptist Church in Birmingham. During his Samford visit, Mathews also spoke to University Fellows and social entrepreneurship classes.